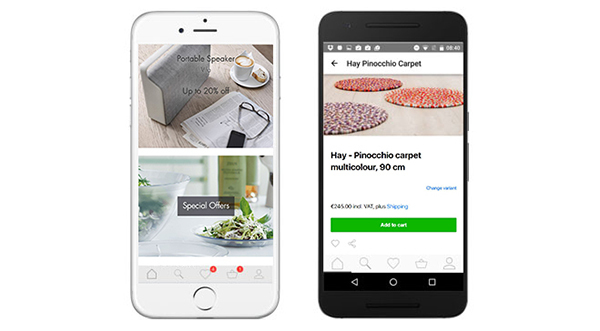 Browse through more than 23,000 products with your phone. Buy your personal favorites safely and conveniently — anywhere and anytime! Download now for free & start shopping! 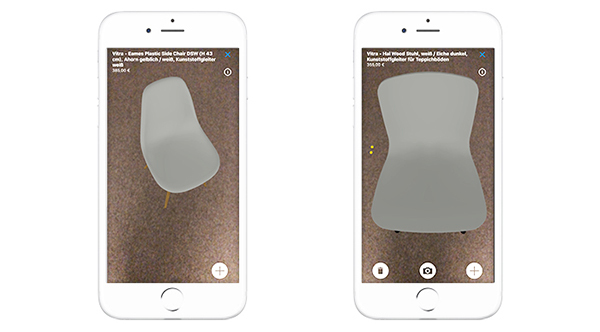 Thanks to our new AR feature in the iOS app—developed as part of an exclusive collaboration with Vitra—you can now virtually test your favorite Vitra design pieces in your home before ordering them. The products are displayed by the smartphone at a true-to-life scale and can be freely positioned and moved around the room. If you are using the iOS version 11 operating system, you will find the AR feature on both the home page and the ConnoxApp product viewing page. 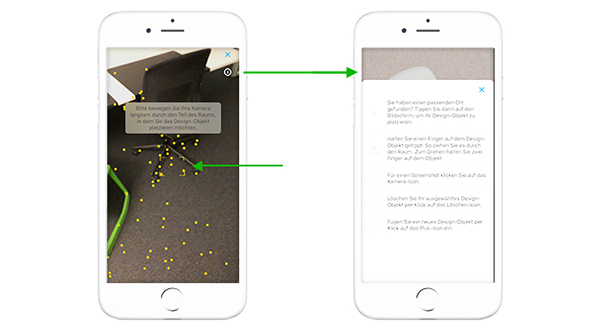 When you move your camera around the room, yellow dots will indicate how well the app detects the area where you want to place your virtual object. The more yellow dots you see, the better the surface detection. By clicking on the "i" in the top right-hand corner, you will find all the necessary information to operate the AR feature. If a solid square appears on your display, this means that a product can be positioned in that space. By clicking on the "+" on the bottom right, the selection menu opens so that you can place your desired item. The product then virtually appears where the square was. You can now take screenshots, delete the product or add more designs. Online Shopping Has Never Been So Easy! No entering of URLs, no logging in and out, no switching devices, no loss of data. Instead: Direct and fast access via ConnoxApp — on the go, waiting in line or at home in front of the TV. 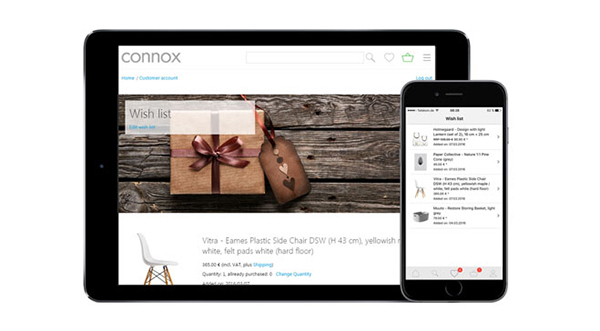 Shopping cart, wish list, and personal data sync across all devices. It's like having the world's best designs with you at any time: Discover new design products every day, find out about design classics, designers and brands! Collect your favorites in your wish list or share them with friends — for example via email, Facebook or Twitter. 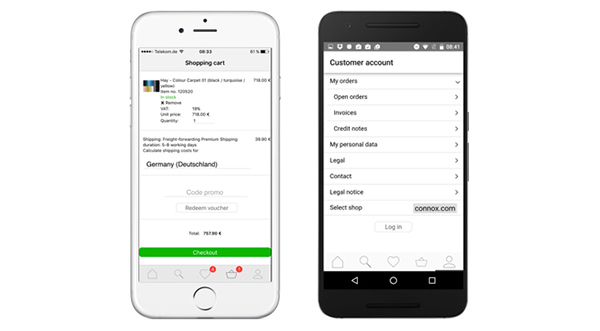 Buy your favorites at any time conveniently and safely via the ConnoxApp in just a few steps. The various payment methods you know from connox.com are also available in our app. And also keep track of open orders, invoices and credit notes. Our intelligent search feature helps you to find specific products. Do you have questions or comments about your order, or would you like to send us feedback? Contact us with a single touch — by phone or e-mail. Comfortably browse, stay up-to-date, want something and shop — wherever you are. Grant yourself the luxury and get the free app by Connox on your phone! Download from the App Store now! Download from Google Play now!